As always, it makes you think. I really enjoy reading you Ally. Very concise and clear way to put complex issues. Life is indeed a struggle for someone trying to find inner peace while someone who they care for is hurting. But indeed, we cannot impose what we wish or want o feel on other people. 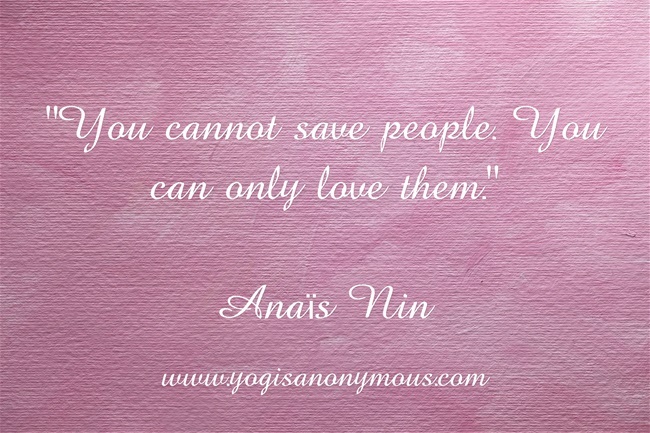 “You cannot save people. You can only love them” is indeed true in this particular instance. It’s not easy to watch people we love as they struggle. Sometimes it’s harder than struggling ourselves. May all beings be free from suffering. Peace to you. “What defines us is how we deal with what we’re given.” So very true. We can choose to be graceful in times of struggle and look beyond others words to see the pain and fear that causes their actions and respond with love and kindness as opposed to anger onlu causing more pain. We cannot heal others, that is their responsibility. We cannot help if they toss aside blessings and disregard gifts, all we can do is hope they find their peace and can find their way back to their center. May all beings be happy. May all beings be free from suffering. Even Charlie Chaplin wrote in his autobiography how one day he decided how important it is to like himself and love himself.And only then was he able to enjoy life. And like and love others too. No doubt, it is really the foundation of everything else in one’s life. If you aren’t in good company when alone, it’s going to be hard to find it elsewhere 😉 Much love to you, Aviva!